Spring training is upon us and baseball is in the air – at least where that air is also warm. Are you excited? 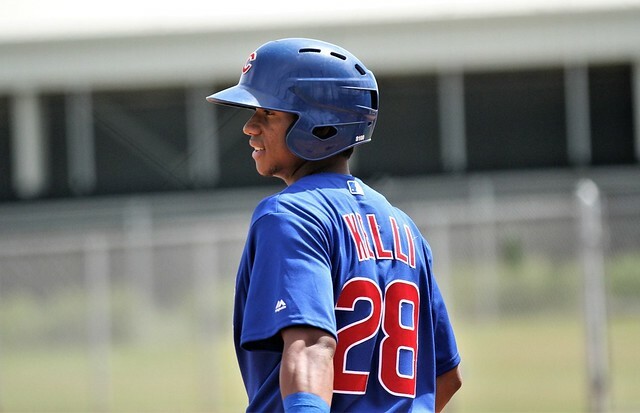 Top Cubs prospect Adbert Alzolay sure is. My top 50 list came out last month and there is at least one prospect that could soon find himself flying up the list. He wasn’t even included in my 2018 Chicago Cubs Top 50 Prospects, but Fernando Kelli has as much potential as anyone to make that move up the list. Kelli is a switch-hitting centerfielder that spent 2017 in the Dominican Summer League. (Shout-out to Adam Searle for first bringing him to our attention. An example would be Fernando Kelli OF CHC. This kid is a lottery ticket, but I perfer the upside he has shown to Garrett. It is difficult to project when they are still teenagers, but Kelli has speed that can’t be ignored. A slow 2016 kept Kelli off anyone’s radar as he struggled to a .240/.329/.247 slash line over 44 games in the Dominican Summer League. Kelli then took a huge step forward in 2017 and hit .320/.437/.443 over 67 games. Kelli also found himself hitting many more doubles and triples, tallying 108 total bases. Interestingly, Kelli was hit by a pitch 20 times over those 67 games in an effort to get his speed on the basepaths. Still, his all-around offensive game is going to need some testing at higher levels. The young Venezuelan led the Dominican Summer League in stolen bases by a wide margin with a whopping 58 steals over just 67 games! In fact, Kelli led all of the minors in steals other than the Rockies’ Wes Rogers – who played nearly twice as many games. He had five games with three steals and even one game with four swiped bags. In the heat of summer, between June 28th and August 9th, Kelli slashed .362/.515/.552 and stole 44 bases over 35 games. During that span Kelli took 31 walks while striking out just 26 times – something else he improved greatly upon from 2016. Kelli is still just 19-years-old and will probably start the year in Low-A Eugene, though the Cubs have added a second team in Mesa and he could end up there. Kelli could be in an outfield with Nelson Velazquez (#12 prospect) and Jonathan Sierra (another who could move up the list) starting this spring to form one of the best outfields at their level. If Kelli adjusts well as he moves through the levels, he could move quickly. Kelli’s defense still has a few more question marks than his speed, but there’s solid centerfield potential (he did play every game of 2017 in center). His first season stateside will tell us a whole lot more, but it’s hard not to get hyped after a glance at his 2017 performance. Make sure to keep on eye on Fernando Kelli in 2018.